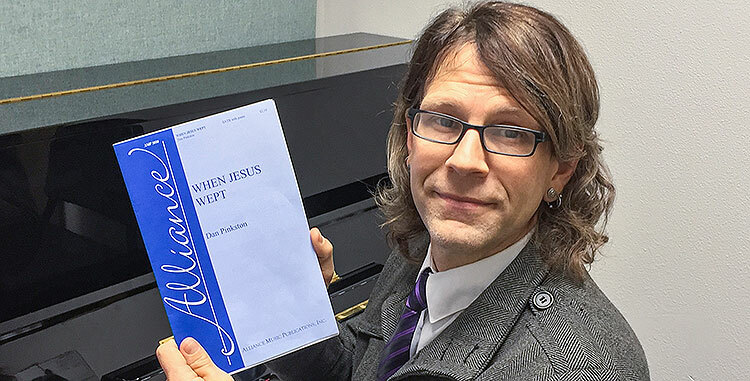 Photo by Matt Murnan / Dr. Dan Pinkston, professor of theory and composition at Simpson University, holds the published version of "When Jesus Wept," a piece he composed for choir and piano. REDDING, Calif. - An original composition by Simpson University music professor Dan Pinkston has been published by Alliance Music Publications, Inc.
“When Jesus Wept” is a piece written for four-part choir and piano. It was commissioned and premiered by Dr. Cyril Myers, assistant professor of choral music, and the Simpson Chorale during a spring 2015 concert on campus. Alliance Publishers is a leader in quality choral music publishing, with an editorial board made up of luminaries in the choral field. The company aims at producing challenging yet accessible choral music. “I wrote the words and melody as a contemplation of Christ’s suffering and death,” Dr. Pinkston said. This is Dr. Pinkston’s second composition to be published by Alliance. In 2008, “My Soul Magnifies the Lord,” also for choir and piano, was printed. During his tenure at Simpson as professor of theory and composition, Dr. Pinkston has won several composition awards and composed two symphonies, premiered by the North State Symphony and Shasta Symphony, respectively.